There's a first time for everything, I guess. You know, snow in July ..... 90 degree weather in December ...... a hurricane in Minnesota ....... a blizzard in Miami ...... W2LJ winning the doorprize in a Hamfest. Yep, that's right! I came home from work today to find a package waiting for me. A brandy new Icom IC-208H was waiting for me along with a note, "Congratulations, you won the SCARC Hamfest doorprize!" You could have knocked me over with a feather. This is the first time I have ever won anything! And one of the things I was planning to purchase in the near future was a dual band VHF/UHF rig for the car. I really need 440 MHz capability for CERT; and this will replace the monoband 2 Meter Yaesu that I have in there now. Of course, now I have to acquire a dual band antenna; but that's OK. I'm glad to have to do it. Wow! The good feeling from this is definitely going to last a day or two. Thank you so much Sussex County Amateur Radio Club and KJI Electronics! No, I'm not going anywhere! The 73 in the title is about one of my pet peeves in Amateur Radio, the misuse of "73". This train of thought all came about because of a "discussion" (that's Ham talk for "argument") that started on the SKCC e-mail reflector. One Ham used "hi hi" in his post to indicate laughter; just as it's done on the air. Another Ham got bent out of shape about it and commented on it. At first, I thought the criticism was pretty petty and picky; but then I remembered my own peeve. The misuse of "73". On the air, while sending CW, it's pretty hard to misuse "73". You send the numerals 7 & 3. Pretty cut and dry. For those of you not in the know; or new to Amateur Radio, "73" means "Best Regards" and is used as at the end or sign off of a QSO. However, in the spoken QSO, 73 is often misused and for some inane reason, that irritates the heck out of me! It's "seven three" when spoken. That's it - no more and no less. It must be a bit of Obsessive/Compulsive Disorder that affects me; but hearing 73 used the wrong way just makes my skin crawl. Almost as bad as dragging fingernails across a chalkboard or scratching a balloon - but not quite. "I have to sign now because I'm destinated." or "This is WA2BCD for ID". A bit of sad news. I see that Jeff K3OQ is shutting down his blog, "Adventures in Radio by K3OQ", which is listed on the blogroll to the right. Good Amateur Radio blogs are not as common as you'd think. There are a lot out there that die by the wayside. I have to admire Jeff though, for officially closing it out and not leaving it to languish and leave you wondering when the next post will appear. Sorry to see you leave the blog scene, Jeff; but I can understand your motives. Keeping this up on a regular basis IS a lot of fun ....... but there ARE times. Times you'd rather be doing something else (actually being on the air, perhaps?). Times when you just don't feel like turning on the computer. Times when you'd rather be with family or friends. Times when your creativity dries up and you can't even begin to think what to write about. If it becomes a chore and it's no fun anymore, then it is time to pack it in. Good luck, Jeff. I look forward to your next Internet adventure. Today was the annual Sussex County Amateur Radio Club's (SCARC) Hamfest. I usually don't get to make this one; as it usually occurs while we're on vacation in Lake George. This year, it fell on the Sunday after we got back; so I was able to make it. The SCARC Hamfest is one of the best hamfests left in New Jersey. Where the others continue to get smaller (with the exception of the Raritan Valley Radio Club - which seems to be growing), SCARC is holding its own. The hamfest is held in the Sussex County Fairgrounds and there is an 'indoor section" with vendors and an outdoor "tailgating section". I'm happy to say that both selling sections were well attended; and the hamfest in general was well attended with plenty of buyers. The tailgaters actually were asking reasonable prices; as far as I was able to ascertain from stuff that I was familiar with. Take straight keys, for example. While there were no "steals", there were no really bad rip-offs, either. About 20 bucks would buy you a decent specimen, which is probably a bit less than you would pay on eBay these days. I didn't have any major purchases in mind, I just went to browse and meet up with old friends. I came away with a bag of PL-259 connectors (12 for $10), a 100 foot spool of antenna rope, a pair of angled cutters for $3 and a neat CERT placard for $2 that I can put in my windshield when I'm on duty for the town. Speaking of town, I picked up a capacitor made by Cornell-Dublier which was based in South Plainfield for years. In essence, I was able to bring the capacitor "home". The factory site is an EPA Superfund site and all the buildings were just knocked over and ground has been paved over. In a few months they are going to rip up the paving and start to remove the PCB tainted soil. Back to discussing my purchases .... I also picked up an MFJ crystal controlled QRP 40 Meter transmitter along with a crystal and a home brewed straight key for $10. 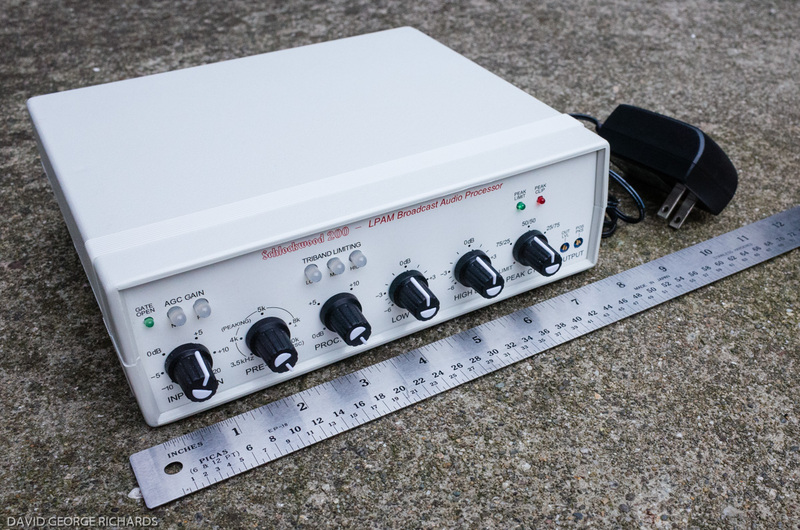 And lastly, I picked up a neat project box for $5 - which would be the perfect size for a small homebrew 40 Meter receiver to accompany the MFJ transmitter. 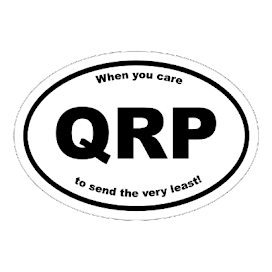 I was tempted to pick up some ARRL antenna and QRP books; but then I realized that a majority of the articles were reprints from QST that I could get online whenever I want. I did hook up with a few friends from the now defunct Piscataway club and I hooked up with Joe WA2QHA, who had won one of the door prizes. Joe lived across the street from me when I used to live in East Brunswick back in my single days. We would often blow each other out of the water with our HF operations; and we would both bother a mutual neighbor who complained that we were BOTH ruining his TV picture. It was good to run into Joe again, who told me he was running mostly QRP these days. I guess our old cranky neighbor is still cranky! Then, as a extra special treat, I got to have an eyeball QSO with Don W2JEK. Don is a fellow NAQCC member and we've QSOed with each other many times in various QRP sprints; but as a result of our meeting, I now have a face to associate with the fist. And THAT is way cool! It was a hot morning; but I had a lot of fun walking around. It was good to rummage through all the junk ....... er, I mean treasures, looking for useful items. My main problem is avoiding impulse buying; which would mean coming home with stuff that I'd end up never using. I did good today on that front. We just got back this morning from our annual Summer vacation trip to Lake George, NY. The lake is 230 miles away from South Plainfield; and we had a much needed relaxing week with a chance to recharge the ol' batteries in a manner of speaking. I could have used two weeks of battery recharging; but I'll not be greedy and be happy with what I was able to get! Of course, I brought the K1 along for some Amateur Radio activity. 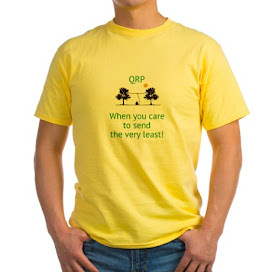 I didn't set up every day; but I did make a few QSOs and got some of my fellow vacationers curious enough to deliver a fine pitch for Amateur Radio. For the most part, I used the PAC-12 with the multi-band coil; although I did also use the Hamsticks on the top of the Explorer. It was much nicer to sit at the picnic table and spread out a bit and enjoy the beautiful weather rather than work from the cramped rear hatch of the Explorer. As I mentioned before, the transceiver was the K1 and I used a 12V sealed lead acid battery as my power supply. The key was a Bulldog iambic paddle and I used QSO Diary on my Palm Tungsten E for logging. 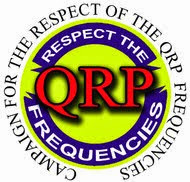 I had QSOs with Fairfax, Virginia and Oak Ridge, Tennessee and Sherbrook, Quebec among other locations. 20 Meters was nice on Friday with lots of European signals being heard with the loudest coming from Germany and Poland. The sound of Morse Code and the sight of the PAC-12 brought a few curious vacationers by the picnic table and I was able to give the "pitch". A few guys and their sons walked away quite interested, especially after hearing those signals coming from across "the pond"; and I promised to follow up with e-mails detailing how to go about getting a license. It seems the "magic of radio" still has the albility to capture imaginations, even these days! Strangley, the folks I spoke to were as impressed or even more impressed with the solar panel that I was using to keep the battery up to snuff. And quite by coincidence, it turns out that the occupant of the next cabin over from us used to be the mayor of Newington, CT; so he was quite familiar with Amateur Radio and the ARRL. I brought along my Autek antenna analyzer; and it made using the PAC-12 so much easier! I was able to pin point the tap setting on the PAC-12 multi band coil to the point where the match was so good that I was able to disable the antenna tuner on the K1. It amazed me to see what a big difference just one coil tap setting would make. With the Autek hooked up I was able to see the SWR jump from 3:1 down to 1.4:1 on the next! It sure takes the guess work out of things! The Autek will now be a permanent addition to my portable ops kit. I brought along the NorCal Doublet; but ended up not using it. Chuck LaPlante, who owns the Stepping Stones Resort, where we stay is VERY accomodating to my Amateur Radio exploits. I didn't want to push the envelope too far by putting up a dipole in his trees, even if it was the very stealthy NorCal Doublet. By the way, if you're an Amateur Radio op and you're thinking of a Lake George vacation; do make a point of looking into the Stepping Stones. It is a VERY family friendly place and my wife Marianne and our two children love the place. Chuck runs a very tight ship; but like I said, he is VERY accomodating to Amateur Radio as long as it doesn't bother any of the other vacationers. Tell him that Larry W2LJ from NJ sent you - I'm pretty sure he'll remember me. I am fortunate to live in the area known as "The Crossroads of the Revolution". This part of New Jersey was the host to more skirmishes, battles and military action during the Revolutionary War; than any other part of the original 13 Colonies. Indeed, just down the road from me is the historic Oak Tree Pond, which was the site of a skirmish between the NJ Militia and the British Regulars that put an end to a flanking maneuver that the British were trying to accomplish in an effort to win the Battle of Short Hills. In the next town over, in Piscataway, NJ, resides the historic Indian Queen Tavern which used to sit on the waterfront in New Brunswick. It was in this very inn that John Adams and Ben Franklin stayed when they came to "inspect the troops" in New Brunswick on behalf of the Second Continental Congress. George Washington was a guest at the inn numerous times; and it is believed that Thomas Jefferson composed parts of the Declaration of Independence while staying there. Which lead me to wonder sometimes, that if Jefferson, Adams, Washington and Franklin were to fall asleep at the Indian Queen on a night in 1776 and were to awake to find themselves in the United States of America in 2008 ..... what would they think? After the initial shock and awe, which would take a long time to overcome, I think that they would have mixed reviews as to what has become of their dream, their "experiment". I think they would be proud of our ingenuity, our technological advancement, our nation's character (for the most part). I think they'd be proud that we expanded to include 50 great States; choosing not to rest and be content to remain a Union of 13 States. I think they'd be proud that we survived the Civil War and became a stronger Nation for it. I believe that while our Founding Fathers were isolationists, preferring not to become embroiled in Europe's politics, that they would be proud that the United States was behind the voice of Liberty and Freedom that carried through two World Wars and various other times of conflict. I believe that the Founding Fathers would be proud that until this day, we remain for the most part, "The Breadbasket of the World", feeding millions besides our own. I believe that they would be unbelievably proud that our flag, The Star Spangled Banner, flies on the Moon and is on the sides of spacecraft that have left our Solar System to explore the deepness of space. I think as a whole, they would be delighted with the character and dignity of the people that today, we call Americans. On the other hand, I am sure there are MANY things that they would shake their heads at; and hold in contempt. I am sure they would deplore the lack of personal responsibility that seems to be so prevalent today. They would certainly abhor the desire of so many for a type of "Nanny State" government that would take care of everything FOR the people. Indeed, they saw such as a throwing away of personal liberty which they regarded as man's most sacred possession. In their minds, government was supposed to exist at the will of the people. It's not supposed to force people to do things they wouldn't otherwise want to do; or interfere with their personal lives and liberties. The would be very sad with the Judicial Branch of our government, who feels it is their responsibility to make laws instead of interpret them - "legislation from the bench". And they would probably be angered to the point of apoplexy by politicians who spend too much time trying to hold on to their jobs instead of DOING their jobs. I think the concept of "political correctness" would smack too much of "European delicacy and gentility" and that they would stay away from that like a cat from water. I am sure they would most definitely shake their heads in sorrow with our fanatical obsession with the "separation of Church and State". I can almost hear them now ... "When we wrote, "Congress shall make no law respecting an establishment of religion, or prohibiting the free exercise thereof" that is ALL we meant!" The desire was for no state religion like The Church of England to become an American institution whereby the President or Congress would become the head of said religion. The Founding Fathers had no desire to separate the United States from God! In fact the Founders believed that a healthy fear and respect of God was necessary for the continuing survival of this Nation. It's so pitiful that so many of our country spend so much of their time divorcing our Nation from God in every circumstance; and then wonder where He is when some kind of natural disaster or calamity occurs. I think they would look at our current system of taxation and would wonder whatever became of the idea of "taxation without representation". This inflation of the size of government and the plundering of the citizen's personal wealth to keep it all going would be very distasteful to them, indeed. Lastly, I think they would have a terrible time with the concept of abortion; and how the Supreme Court could have so badly misinterpreted the Constitution as to think that somehow murder (yes ...... murder) would be protected by that Document. So ....... the question remains ....... would they be proud? I am certain that for the most part they probably would be; but at the same time they'd also be very sad to see how their legacy was mishandled by succeeding generations. In any event, the Nation remains strong, prosperous and proud. Happy Birthday, United States!To all of you out there, have a wonderful, safe and happy 4th of July weekend. The 20 Meter QRP Foxhunt season officially opened tonight. The two Foxes were Bill AA4LR in Georgia; and Dale WC7S in Wyoming. Bill was filling in for John K4BAI who was originally scheduled for tonight; but ended up having to be out of town. Bill was surprisingly loud; and I found him quite easily. He was a good 589-599 and was handling hounds at a nice clip. But I expected to hear him less well than I did, given the proximity between New Jersey and Georgia. I thought that Wyoming to New Jersey would be the easier trip for 20 Meters; but I was sadly mistaken. After working Bill, I went hunting for Dale and found him - barely. He was 339 (maybe 449 at peaks) all the way. I called him for a good hour and fifteen minutes and there was once or twice when I thought he'd heard me, so I sent my exchange anyway. Let's put it this way - if my call find its way into his log, I will be VERY surprised! For the second year in a row, it's been my job to organize the QRP Summer 20 Meter Foxhunt season. The operators are superb - all top notch and it's been a pleasure working with them. It's also nice to be involved in something that gives a lot of your fellow Amateur Radio operators so much fun.